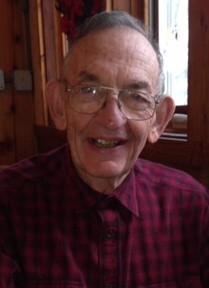 Derry W. Wagner, age 92, passed away peacefully on Thursday, February 7, 2019 while in hospice care at the Cottages at Cedar Run in West Bend. He was born on October 23, 1926 in Burlington, WI to Herbert and Ora (McCartie) Wagner. He was the oldest of two children. The family resided in East Troy before moving to Madison, WI where Derry graduated from Central High School. Upon graduation Derry joined the US Navy during WWII and served as a ship’s radio operator. Following an honorary discharge, Derry attended and graduated from the University of Wisconsin-Madison School of Business with a degree in Accounting. He worked as an insurance agent at the BC Ziegler Company following graduation in 1950 and was promoted to Senior Vice President, retiring in 1989. Derry married Joan Duffee in 1950 and the couple remained married until Joan’s death in 2016. Derry was an active member of various civic organizations including the West Bend Rotary Club, American Legion and the West Bend Country Club. He also served on the board of directors of The Threshold Foundation. Derry was an avid golfer and thoroughly enjoyed his Thursday nights at the WBCC. Derry and Joan enjoyed vacations in the Northwoods and shortly after retirement bought a cottage outside Minocqua. Derry is renowned by those who knew him for his support of the Wisconsin Badgers, traveling and spending time with friends and family. Derry’s boisterous voice and infectious laugh will be missed by all who knew him. Derry is survived by his five children; Susan Cooper, Catherine Brath, Barbara (Brian) Rismon, James (Terri), and Andrew (Suzanne), as well as 11 grandchildren and 5 great grandchildren. He is further survived by other relatives and friends. Derry is preceded in death by his parents, his beloved wife, Joan, and sister Audrey Neerland. Derry’s life will be celebrated on Friday, February 22, 2019 with visitation at 10:00 am at the Myrhum-Patten-Miller & Kietzer Funeral Home at 1315 W Washington St., West Bend and service beginning at 11:30 including military honors. Derry will be laid to rest at Washington County Memorial Park. In lieu of flowers, memorials are appreciated to the Cottages at Cedar Run and the Alzheimer’s Association. A special thank you to Cedar Hospice and the caring staff at The Cottages. The Myrhum Patten Miller & Kietzer Funeral Homes have been entrusted with Derry’s arrangements. Additional information and guest book may be found at www.myrhum-patten.com.